All of a sudden, it seems, the stone fruit is in the market. We have peaches, plums, apricots–and big, sloping piles of bright red cherries. The cherry season is short, and very sweet. And while we have a cherry pitter, and sometimes use it (ice cream, tarts, once in a red wine reduction for lamb), the cherries rarely last long enough to make it into something as complicated as a recipe. 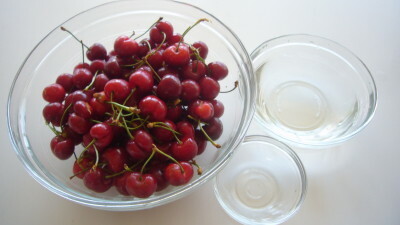 I’m all about simple, these days, and letting my children experience food in its whole, pure state, so when the cherries come home on Sunday I pour them into a big glass bowl and set them in the middle of our home’s Command Central (aka the Kitchen Table) with a small bowl of water for rinsing and a smaller bowl for pits. We have an open floor plan, so all day long the kids & their friends & Kory and I pick, dip, & eat. On Memorial Day they were ravaged before, during, and after dinner as the kids carried the three bowls back and forth from appetizer to dinner to dessert table. They’re a snack, of course, but because we eat only what’s in season at our local market things like cherries feel like a rare treat. 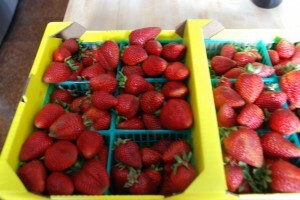 This is one of the great things about eating locally and seasonally. On the one hand, things taste the way they should–& impeccably fresh–but it’s also exciting every time something new shows up. And yes, they are expensive. At $5-7/lb they cost us. But I think it’s worth it to have such an excellent snack to binge on for a few days, and in the long run, that $7 is teaching the kids about many, many things besides how great cherries taste. And it’s keeping them healthy. With seasonal eating, we appreciate each crop all the more, we look forward to each new harvest, and we really do celebrate every mouthful. Even Ella and Finn know that they’re getting something special. The cherries, on the other hand, are lucky if they see Tuesday morning. 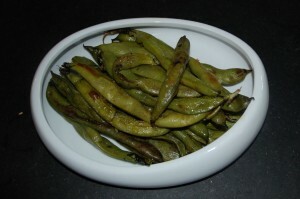 In the last couple days, I’ve experienced one of those funny swirls of coincidence that crop up sometimes: we received fava beans in our mystery produce box; before I could cook them, we happened to eat some grilled at a local restaurant; the next day, my email update from Heidi Swanson’s 101 Cookbooks blog offered a recipe for grilled fava beans. 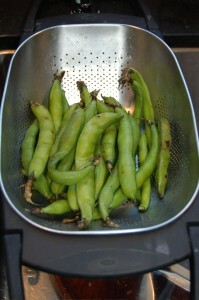 The universe was telling me to grill fava beans. However the grill, which turned out to be out of propane, was telling me to do something else with them. Tony reminded me that roasting is a fine substitute for grilling, so that is what I did. You lose that nice smoky flavor that the grill imbues, but the beans are still incredibly tasty. Almost as important, this method of cooking the beans takes the effort of shucking and peeling the beans out of the kitchen (or wherever you prep your food) and onto the dining room table (or wherever you gather to eat). 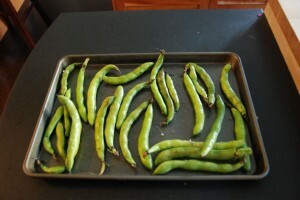 Prepping raw fava beans can be pretty labor intensive (shucking, blanching, peeling), and while it’s certainly something you can do with your kids, or delegate to them entirely, when my kids do it, they wind up eating all the beans raw and not leaving me any to cook. 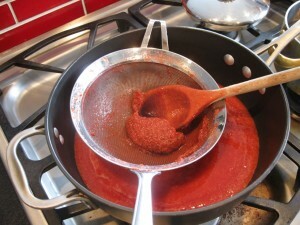 So this gets the cooking done fast, and then whatever’s left over of the roasted beans can be pureed into a delicious spread or thrown into a salad, a pasta or a risotto. Preheat the oven to 425. 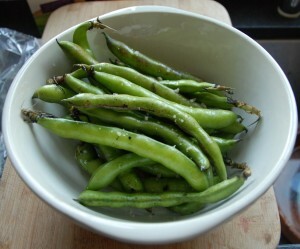 Rinse the fava beans and spread them out on a roasting pan with a generous splash of olive oil and a sprinkle of salt and maybe some hot pepper flakes, to taste. Roast, stirring once, for 10 to 15 minutes, or until they are blistered and tender. Toss them into a bowl and eat. We found them so tender (and the roasted skins so salty and delicious) that we ate them pods and all, but you can also pop the beans out, of course, and just eat those. As I have written elsewhere, there’s always room in my repertoire for one more banana bread recipe; this one I found originally in The Baker’s Dozen Cookbook and have been tinkering with it (reducing the fat and sugar, upping the protein) ever since. 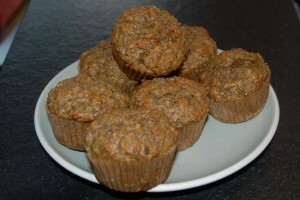 You can make these as a quick bread (bake for about an hour) or muffins (bake for about 25 minutes); either way, they are banana-y, buttery and delicious. Note: you can certainly make this with 1-1/4 c all purpose flour (omitting the whole wheat flour and wheat germ) and with 8 T (one stick) of butter (omitting the flax seed), and it’ll be delicious, just not so virtuous. 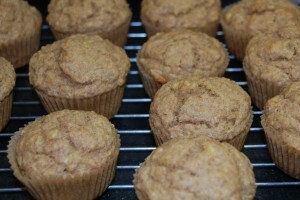 Preheat the oven to 350 and grease an 8″ x 4″ loaf pan or a 12-cup muffin tin. Mash the bananas in a medium bowl until pretty smooth. Whisk the flours, wheat germ, flax seed, baking soda, and salt in another bowl. Using the flat whisk in a stand mixer, mix the sugar and butter well to make a stiff paste (you can also do this by hand, of course). Beat in the eggs one at a time, mixing well after each addition. Mix in the mashed banana. Stir in the walnuts, if using (don’t worry if the batter looks curdled). 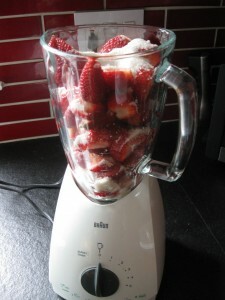 Now add the flour mixture and stir until just blended (don’t overmix or worry about a few lumps). Put the batter in the prepared pan. Bake until a skewer comes out clean, about 45 minutes to an hour for bread, 25 minutes for muffins. 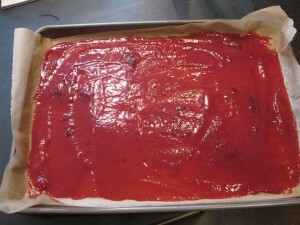 Cool on racks in the baking pan for 10 minutes, then remove from the pans and cool completely.